I just finished reading a really riveting book of local history about a little known and even less understood free speech case that arose at Appalachian State University and went all the way to the U.S. Supreme Court. 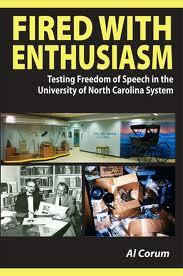 I’m talking about Al Corum’s Fired with Enthusiasm: Testing Freedom of Speech in the University of North Carolina System. I got hold of a copy of the book last Tuesday and finished it on Thursday, stealing every minute I could from otherwise full days to keep reading. The story is compelling – a nine-year legal battle at the end of which Al Corum was awarded damages and got his protest of secretive and heavy-handed administration actions vindicated. When Herb Wey retired as the top-dog at ASU, a noticeable “corporate culture” began to take hold, a style of administration that was top-down, uncollegial, secretive, and authoritarian. In 1984, one of those top administrators ran over Al Corum like a Mack truck, assisted by sub-administrators in the power structure who carried out the dirty work. The administration action that Al Corum protested and which got his salary cut, himself demoted and relegated to humiliating busy work, looks pretty similar to vandalism, the disrespectful and even destructive treatment of that portion of the Appalachian Collection devoted to cultural artifacts – musical instruments, handmade furniture, looms, household items of all sorts. Those things simply got in the way of bigger plans and were clearly under-valued by the top administrators. After the Corum suit was appealed through the Supreme Court of North Carolina and all the way to the U.S. Supreme Court, on appeals from the University (being represented by the NC Attorney General’s office), it landed back in Superior Court of Watauga County for a jury trial. It took one full day to enpanel a jury, and on the next day, when the trial was supposed to take place, the university caved, offered Corum a settlement which he ultimately took (the cash really didn’t cover his legal fees for the nine years’ struggle). But he was vindicated. Copies of Fired With Enthusiasm are currently available locally only at the ASU Bookstore at the end of Faculty Street, in a section devoted to published works by ASU faculty. I’m told that the book will be listed on Amazon in a matter of weeks. Is it not a little bit hypocritical for this site to post a story on censorship when posts here are censored on a regular basis? No, of course not. It is perfectly fine for a liberal to censor, but not to be censored. Isn't it funny how there has to be a special bookstore that carries the work of ASU professors that doesn't sell anywhere else. Most of them use their books in their own classes so the students will have to buy them or none would ever sell. I have known Al Corum for many years and I find him to be a fine man. I also had the opportunity to serve with him on a committee at App State. I am eager to read this book. You mentioned the Appalachian Cultural Museum ... This all comes down to several people, their personal friendships, their dirty politics, and them getting what they wanted. The list is as follows: Dr. Peacock; Richard Sparks, CEO of Appalachian Regional Healthcare System; John Blackburn, ASU Board and App Reg. board chair, UNC Board of Governors; Jim Deal, ASU Board, App Reg. Board, UNC Board of Governors; App Regional Board Chair. They wanted a nursing school and needed a place to house it. Interesting, App. Regional purchased old Lowe's property from Board Chair Wilcox, Board Member Jim Deal, and John Winkler (spouse of App Reg. Board member for $3 million dollars and obviously land can not be used. Also App Reg. Urgent Care is in space rented from Mr. Wilcox. I see some conflicts of interest from the top all the way down. I see a hospital CEO that should have been fired. This is what is happening in our county and university. Wait and see when Sparks retires I can assure you their will be a position in the new Nursing School, so they can promote their golden boy, Chuck Mantooth to CEO of App Regional. Opoib said: "Is it not a little bit hypocritical for this site to post a story on censorship when posts here are censored on a regular basis?" I don't always understand why JW chooses to post the comments he does, and at least 3 of mine have not been posted in the past. However, this is his personal blog and as such it's his call what comments he wants to include. Newspapers don't post every letter to the editor, either. This is not the same thing as official or government censorship and that's a very important distinction to make. This is very true, Not Really. Williamson is paying for the ability to give himself an advantage because he has no chance otherwise, is he not? Anon 10:14, I doubt JW pays for this blog space. Like so much else on the internet, it's free. And since he created this space, he's free to manage it as he sees fit. If you or I or anyone else doesn't like his policies we're free to move on. Me, I don't always agree with what's posted here but I often find out about news that I wouldn't otherwise hear about. That's the main thing that keeps me coming back. You can disagree with his comments policy but I think I may understand why he moderates them. I gave up on reading the comments on the Watauga Conservative blog because there's so much ranting, repetition, personal vitriol, and just general dreck posted there. It's not worth my time to wade through all that just to find the one or two rational comments. It might also be that you never won a debate on the Conservative, Not Really. You can't tolerate those that disagree with you. Anonymous 11:36 said... "It might also be that you never won a debate on the Conservative, Not Really. You can't tolerate those that disagree with you." See now, I love a good debate but the key word there is "good". This is the kind of tired back and forth that accomplishes nothing. You don't know me and and I don't know you, so if you're not going to stick to the topic and instead choose to make untrue statements about me (because anyone who knows me would tell you in an instant that I get along with people of all stripes, political and otherwise) then the conversation is not worth my time.